You wake up with no power and two hungry teenage boys home from school. What’s a mom to do? This mom took them out to breakfast. We love going to breakfast while we’re on vacation but it’s a rare treat while we’re at home. We headed to The Original Steve’s Diner, which is tucked in a strip mall on Penfield Road in Penfield. We had attempted dining there twice before, but the first time it was closed. On the second try, a line stretched out the door, and we didn’t have time to wait. This time we walked in and sat right down – our timing was lucky because a line formed shortly after we arrived. It appeared that other families had the same idea. It’s a small place – it seats about 50 – and the décor was nondescript. But the service was prompt and friendly in spite of the rush. I had wondered about the “original” in the name of the diner. It turns out there are a lot of original choices on the menu. 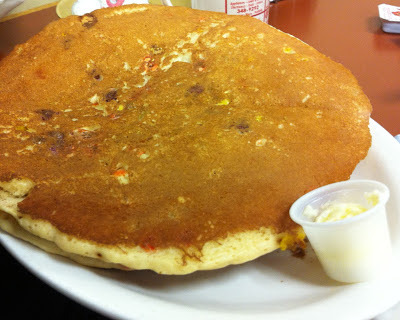 Son #1 chose Reese’s Pieces pancakes from the long list of pancake creations. They were thick and bigger than his plate. (My advice: order one pancake unless you have a mammoth appetite.) The menu also featured a list of interesting plays on eggs Benedict. Son #2 and I both ordered unoriginal omelets, both of which hit the spot. I prefer home fries with more brown crispy surfaces, but they were well prepared. The Original Steve’s Diner was a comfortable refuge from Sandy’s aftermath. We’ll be back – even if it means waiting in line. Reeses Pieces pancake! Holy moly, my son would have gone for that one too. So sorry you lost power, but I'm glad there was somewhere to take refuge. I hope everything is back to normal for you soon. Meatball cookies -- getting closer!